First of all, props to my friend Miller who came up with the name and inspiration for this Vennsday. Yes, that's a real person, not a bottle of beer that I call my friend, although I do that, too. Anyways, Lent is a time of restraint and penance and prayer. It is like a cleanse for your soul, in which you live on only lemon soul juice and cayenne soul pepper, and you feel terrible until the hallucinations come on, and then you feel great because you think you just defeated the devil. It is, in short, the antithesis of me. Fun things about Lent: saying Maundy Thursday and being a kid and having sword fights with the cross-shaped palms on Palm Sunday. 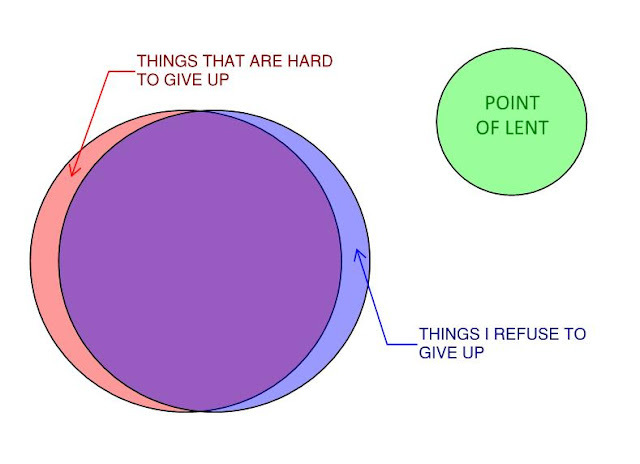 Not-fun things about Lent: everything else. Know what I like? Things that I like. So I'm gonna keep doing 'em. Maybe I've been a little too hard on the Church thus far. I mean, if it weren't for Lent, there would be no Mardi Gras2. And if there were no Mardi Gras, my only excuse for drinking on Tuesday would be "why not?" I don't want fish on Fridays. I want a beer and a burger. Or maybe like a beer and a burger, but instead of buns, there will be two filets and some pork belly, and then that will be followed up by a bourbon. Fish is for Sunday brunch when I want something light. Or maybe for Saturday happy hour at the sushi restaurant. 1I think it's clear to everyone that today isn't my best day for similes. 3I have never actually commented on youtube anything in my life because that whole comment realm makes me believe that it's the end times.